There are some stores like Tesco and Asda that, frankly, we expect to deploy every sales trick in the book. But there are others, notably John Lewis/Waitrose and Marks & Spencer where you may pay a bit more, but you expect to get - and usually do get - ethical treatment. However, I may have just spotted the dirty tricks department at M&S in action. 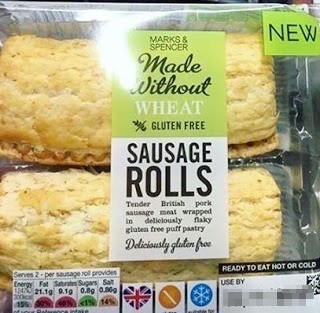 It was only then that I noticed that I had picked up gluten free sausage rolls. Now, looking at the packaging you might think it was obvious, but all I saw was 'Sausage rolls'. So I went back and replaced them with ordinary sausage rolls - they were 75p for the two pack. So I nearly got hugely overcharged. Like 99% of the population, I am not gluten intolerant - and like the rest of that 99% I should avoid gluten free food, which usually has more additives and always has more fat to provide some of the sticking power of natural gluten. (In this case, the ordinary sausage rolls only had 75% of the fat of the gluten free ones.) Let's be clear there are ZERO health benefits to eating gluten free if you aren't gluten intolerant, and significant negatives. But why am I making a fuss when I picked up a pack that was clearly labelled? Because the gluten free sausage rolls were next to the ordinary ones, not in a separate gluten free section. Generally speaking, a separate gluten free section is the best solution for both shop and customer. For the shop it means less opportunity of confusion, and for the customer, if you are in the 1% of sufferers you can see where your bit is, if you are in the 99% who aren't, you can find the normal stuff. As far as I can see, there is only one reason for putting the gluten free sausage rolls in with the ordinary ones. And that is because people in a hurry will do what I do, pick up gluten free sausage rolls from a 'normal food' section and pay extra. And if that is the reason, this really is a rip-off.